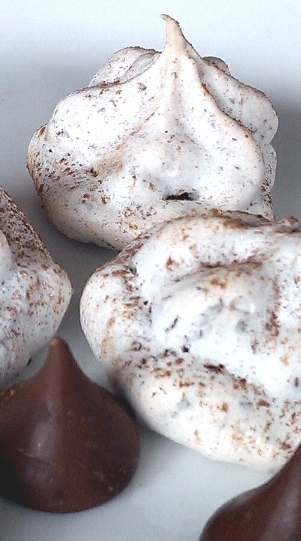 Triple Chocolate Kisses are meringues with chocolate centers. They look elegant but are very easy to make. Grated baking chocolate, chocolate kisses, and a dusting of cocoa powder combine with a light, fluffy meringue to make a scrumptious and deceptively stylish cookie that’s perfect for chocoholics. Separate egg whites from egg yolks, being careful not to break yolks. Set yolks aside to use in another recipe. Allow egg whites to stand at room temperature for 30 minutes. Preheat oven to 325º F. Line baking sheets with parchment paper. In a dry, medium bowl on very high speed, beat egg whites, cream of tartar, and almond extract until soft peaks form. Peaks will be bright white when stiff. You can set beaters in mixture, lift them out, and egg white peaks will remain formed. Continue to beat egg whites at a high speed as you gradually add granulated sugar, about 1-2 tablespoons at a time, until sugar is dissolved and the batter forms stiff, glossy peaks. Use a rubber spatula to gently fold grated baking chocolate into the meringue. Insert a medium open-star tip in a pastry bag or cookie press. Fill the bag or press with meringue. Pipe 24 one-inch disks onto prepared baking sheet, about 1-2 inches apart. Press a chocolate kiss in the center of each disk. Pipe a meringue star over each disk/kiss combination to completely cover the kiss. Dust the meringues with baking cocoa. Bake cookies for 15-18 minutes until the edges begin to turn golden. Remove baking sheets from the oven. Slip meringues off parchment paper. Allow them to cool completely on wire racks. Store cookies in an airtight container. When preparing Triple Chocolate Kisses, be sure to add granulated sugar just a bit at a time to the beaten egg whites. Do not overbeat. Otherwise, egg whites will liquefy. No-Bake Peanut Butter Kiss Cookies: no oven needed!